Published on July 14, 2011 in Gluten-Free, Hearty Side Dishes and Low-Sodium. Closed Tags: black beans, mexican. How can you go wrong with cilantro and lime? 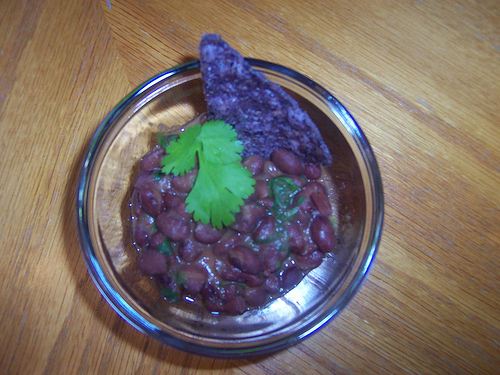 These beans are great served alone, in tacos, with some tortilla chips for dipping, or along with some fajitas. Makes 4 as a servings as a small side dish. Drain and rinse the black beans. Combine all ingredients in a medium saucepan over medium-low heat. Cook for at least 5 minutes stirring occasionally or until heated through. At this point, you can serve the beans, but I like to cook them over low heat for closer to 30 minutes or until the beans start to fall apart and become the consistency of refried beans. Add some tomato or onion.